Hershey’s chocolate scientists are now 3D printing uniquely designed candy. The confection company is taking its CocoJet 3D printer from 3D Systems to different exhibits throughout the U.S. to show chocolate lovers how this futuristic candy machine creates uniquely delicious designs. Consumers interact with a library of 3D graphics on an iPad to get the machine to form a number of chocolate designs – including complicated hexagons and intricately laced patterns. The CocoJet works on open-source patterns so it’s possible to upload your own design to the CocoJet, too. According to Hershey’s tech marketing exec Jeff Mundt, it’s a bit more complicated to get a figurine, but you could theoretically make yourself (or your crush friend) into a chocolate replica. There are other chocolate-centric 3D printers out there. The Choc Edge is one that will also customize chocolate designs. Some 3D food printers can also take on the silky smooth texture of chocolate. However, Hershey’s believes its CocoJet is the most technologically advanced chocolate 3D printer in operation. “We can print anything that you could print with a plastic printer in chocolate. 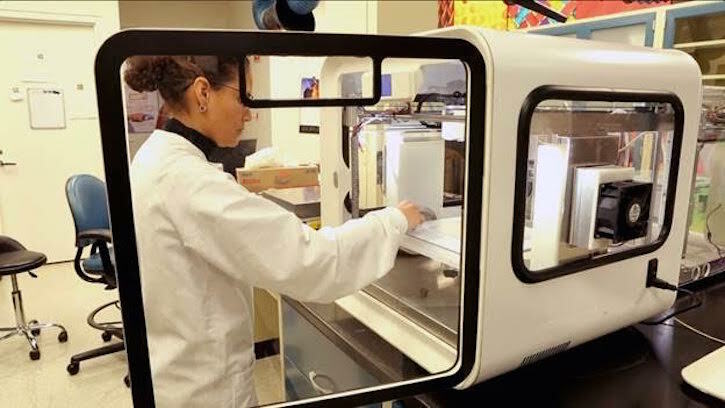 It looks very similar to a standard 3D Systems printer but it’s heavily modified,” Mundt told TechCrunch. We caught up with Mundt and the CocoJet while it was on display at Brit and Co’s Re:Make 2015 conference in San Francisco to check it out. Watch the video above to see some of Hershey’s mouth-watering delights 3D print before your very eyes.